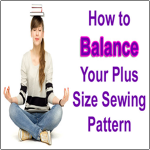 You’ve spent your precious time altering your pattern, trying on a test garment, making more adjustments, trying on another test garment and finally it fits! Now what? Do you buy another pattern and do it all over again? Why not use the pattern you altered to make more styles, especially since you know it fits? 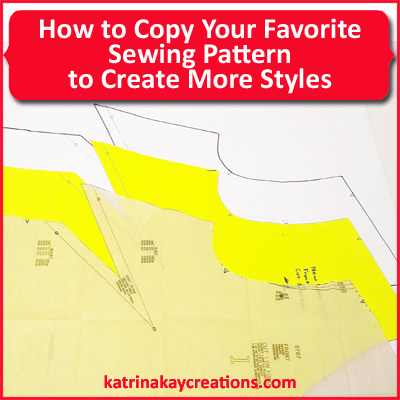 I’m going to show you how to copy your favorite sewing pattern to create more styles, so you can spend more of your money on fabric and less on patterns that don’t fit. This is what the pattern companies do, right? They have multiple views of, for example, a top. 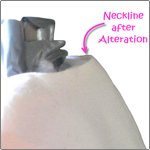 Each view uses the same top, but changes the collar, neckline, sleeve, etc. Professional patternmakers use a sloper that has been fitted on a dress form or fit model as a base pattern for all of their designs. They don’t start from scratch every time unless they’re draping the fabric directly onto the dress form. Oh, if only we could just drape the fabric on our own bodies. But it would be painful sticking straight pins into ourselves. Ouch! Professional patternmakers use oak tag or tag board instead of poster board, but that can be very expensive. Even if you need multiple pieces of poster board, it’ll cost a lot less than oak tag. 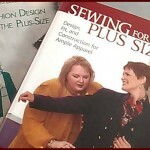 So, are you ready to copy your favorite sewing patterns so you can create new styles? In the video below, I’ll show you how to copy your pattern on poster board, which will make retracing your pattern (to create new styles) hassle free and fast. Thanks for sharing this video. I always enjoy watching your videos and reading your blogs. Keep them coming. Have you ever used Pelon to trace patterns on? I’m glad you enjoy the videos, Ernie. Thanks so much for watching. No, I’ve never used Pelon but I have seen people suggest using it. I don’t see why it couldn’t be an option. You’re welcome, Mary. Glad I could help. You make patterns for dolls? That’s something I’ve wanted to do just for fun, but haven’t found the time. Is there a video on how to duplicate a pants pattern? If not, how would I apply the instructions in this video to a pants pattern? Would I line up the grain line at the edge of the poster board and split the pattern on the grain line. I apologize if I missed this information somewhere else, and if I have, please redirect me to the instructions. I’m glad I found your video on balancing of pants pattern pieces. I recently took apart a pair of good fitting pants that had been nibbled by moths to use as a template to alter other pants. In general, the crotch and front/back rise are my biggest challenges. I haven’t done a video on duplicating a pants pattern, Joanne. You can check out this video on making a pattern from your favorite pants at http://bit.ly/1FDCZtG. I would trace the pant legs out flat as he did in the video, then use the tips in my balancing your pants pattern video (https://katrinakaycreations.com/?p=1257) to balance your pattern. To find the grainline of your front and back pants pattern pieces, find the midpoint of your hemline-that’s the hem fold, not your hem allowance. Then fold your pattern piece in half, matching the side seam to the inseam at the hem. When you unfold the pattern piece, the crease is your grainline. I hope this helps and thanks for reading and watching my tutorials. Thanks sew much for this !!! I really appreciate these tutorials!!! Brilliant!! 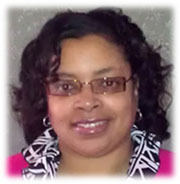 Thank you so much for such an easy straightforward video on how to save your favorite patterns. Great video katrina. I have a few patterns I use all the time but I never thought about putting them on poster board. I am now going to transfer them using your method. Btw, I store my patterns on pants hangers. Those cheap plastic ones – not the ones with the metal clasps. The plastic ones don’t have the teeth like the metal ones so it doesn’t damage the pattern. I keep them hanging in the closet. 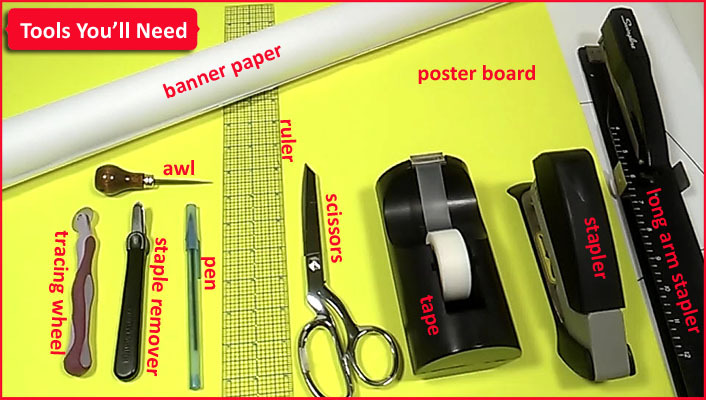 It works really well and I imagine this method would work well with the poster board too. I never thought about using pant hangers, Sharon. And I have plenty of them. I usually punch a hole in the top with a hole punch and hang them, but I like your idea better. That’ll definitely work for poster board. Thanks for sharing! Thank you for sharing that, Katrina. I have just purchased some heavyweight interfacing to use for making pattern pieces. I haven’t actually cut out any fabric with the pieces yet, but I have high hopes that it will work. Really enjoy your website. You’re welcome, Alleluialu. Let me know how the interfacing works out.